Garden Lodge - Bed And Breakfast Bed And Breakfast 324 Canterbury Road, Densole CT18 7BB. Garden Lodge - Bed And Breakfast, 324 Canterbury Road, Densole CT18 7BB. Garden Lodge, only 10 minutes from the Channel Tunnel, is a convenient and comfortable family-run guest house with a Visit Britain Guest Accommodation 4-star rating and guaranteed private parking. Whether on business or leisure, the Garden Lodge could not be more ideally placed close to Dover (11.2 km/7 miles) and its cruise terminal; Folkestone (6.4 km/4 miles) and the beautiful cathedral city of Canterbury (19.2 km/12 miles). The Garden Lodge is a very comfortable family home. 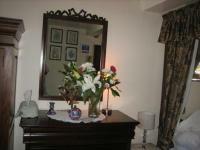 The rooms and restaurant are well-decorated, very comfortable and with a strict non-smoking policy. The beautiful garden has aviaries, a fish pond and a mosaic tiled, solar heated swimming pool (summer months only) with steps for easy access. The restaurant offers homemade food, often using home-grown vegetables and fruit. Stay for at least 3-nights and receive a complimentary foot passenger day trip with SeaFrance. Hotels in Densole: Garden Lodge - Bed And Breakfast, 324 Canterbury Road, Densole CT18 7BB.